The Sonoran desert sizzled tonight following a stellar showcase of talent and skill by WBC Youth World Super Bantamweight Champion Diego De La Hoya (18-0, 9 KOs) who battled Erik Ruiz (16-7-1, 6 KOs) of Oxnard, Calif. in a competitive 10 round featherweight main event on Golden Boy Boxing on ESPN. Golden Boy Promotions Chairman and CEO Oscar De La Hoya was in attendance along with Los Angeles Lakers NBA star Metta World Peace for the sold-out event at Casino Del Sol that was televised nationally on ESPN with commentary by future Hall of Famer and legendary fighter Bernard Hopkins and Bernardo Osuna. Throughout the main event, Ruiz took his opponent’s swift combinations with a solid chin, remaining focused and alert to counter with defense, but De La Hoya varied his punches round by round to keep Ruiz on his toes. De La Hoya showcased his ring generalship consistently, demonstrating skill and maturity. In the late rounds, De La Hoya showed his speed with fierce, back to back combinations as he worked to rattle Ruiz and reduce his confidence. In round nine, Ruiz fought back with powerful right-hands as the two went toe-to-toe in the homestretch. Round 10 brought both fighters into a competitive showdown as they unloaded on each other in the seconds before the final bell. Final punch stats showed De La Hoya led with more jabs and power punches over Ruiz. The judges scored it 100-90, 100-90 and 99-91 giving De La Hoya the unanimous decision victory. In the TV co-main event, D’Mitrius “Big Meech” Ballard (17-0, 12 KOs) retained his undefeated status against the rugged Adrian “Tyson” Luna (18-5-1, 11 KOs) of Ciudad Nezahualcoyotl, México and claimed the vacant USNBC super middleweight title following a 10-round bout that went the distance. It was Luna’s first fight in the U.S. and Ballard’s toughest test to date, with Luna rallying to put the pressure on in the middle and late rounds. In the final round, Ballard landed a series of right hooks that left Luna slumping and on the defense. The judges scored it 97-92, and two scores of 95-94 in a unanimous decision victory for Ballard. Also on the undercard, rising prospect Hector “El Finito” Tanajara, Jr. (9-0, 4 KOs) of San Antonio, TX decisioned Daniel “Menona” Bastien (4-5, 1 KO) in their super featherweight bout with all three judges issuing a score of 60-54. Roberto “Tito” Manzanarez (35-1, 28 KOs) of Phoenix and Erick Martinez (13-7-1, 7 KOs) of Tijuana, Mexico tussled in a super lightweight bout that went the full eight scheduled rounds, but it was “Tito” that walked away with the “W,” securing a victory by unanimous decision from the judges. Jonathan “Thunder” Navarro (9-0, 5 KOs) of East Los Angeles and Ricardo Fernandez (3-5-4) also battled on the stacked undercard in a six round welterweight bout. Navarro was given the victory by unanimous decision after the six scheduled rounds to remain undefeated. In the opening fight of the night, Joshua “The Professor” Franco (10-0, 6 KOs) demonstrated in the ring how he schools his opponents with a first-round technical knockout victory over Marco Sanchez (9-5-2, 4 KOs) in their super flyweight bout that was scheduled for six rounds. 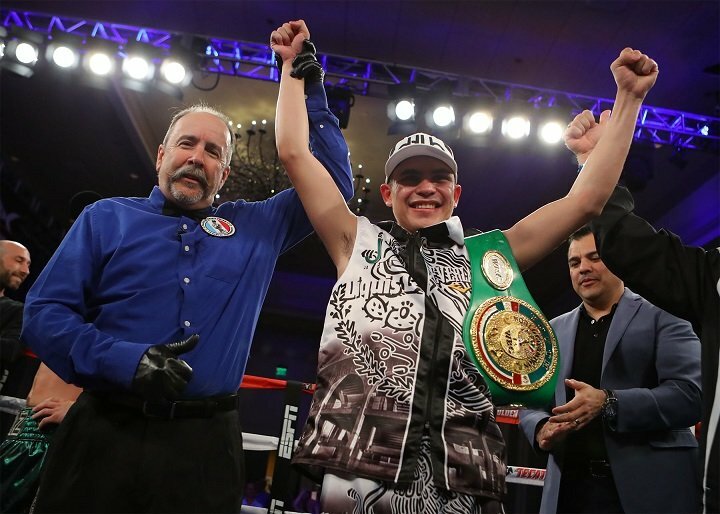 Golden Boy Boxing on ESPN will return to Casino Del Sol in Tucson, Arizona on July 29 for another stacked card showcasing some of the best up and coming talent in the sport today. De La Hoya vs. Ruiz was a 10-round featherweight bout on May 18, presented by Golden Boy Promotions. The event was sponsored by Tecate “Born BOLD.” ESPN Deportes and ESPN transmitted the fights live from Casino Del Sol beginning at 10 p.m. EST/7 p.m. PST. ESPN3 live streamed the fight at 8:30 p.m. EST/5:30 p.m. PST.